So she didn’t tell them a thing? And why is that? Mary is obviously become insane and need to be dealt with. So…does Allison doubt what she saw, is in active denial, or is she fishing for how much she needs to step in? Hmm, she’s hiding that she recognised the killer. I don’t think Alison can reasonably blame herself for Miles’s death. Her fame has a large enough random factor when it comes to interacting with people that you might as well ignore it outright when making a consequentialist decision tree. Wow. So I’m guessing Moonshadow’s powers have gone full-on Somebody Else’s Problem Field now? That’s cool, and also terrifying. Of course, Allison could just be not telling people it was Mary, to try and investigate it on her own, but frankly I don’t see that happening. EDIT: Okay, now that I look at it again, she’s definitely hiding it. While that mean Moonshadow’s not as scary, it still seems a bit odd on Allison’s part. Hmm… Alison seems to be holding back some critically important information. Perhaps she wants to handle this herself? Or maybe Moonshadow’s anomaly has gotten powerful enough to make people forget? There’s no doubt in my mind. Maybe it’s like a police investigation. Can’t share details with civilians so long as it’s ongoing. I’m going to give Alison the benefit of the doubt because not telling your doctor about a murderer doesn’t seem like a huge deal. That’s her doctor, not a member of law enforcement doing a witness interview. *However* If she doesn’t share the information by the end of the day, then yeah. Tsk tsk. that’s not just her doctor tho, she’s with the government. That’s why she’s talking about “we” this and that – the “we” is the Department for Biodynamic Research & Defense. Sounds like the prevailing opinion is that Jack Slash is doing it. Is that a CT (cat) scan? Why? Why not? Her anomaly is weird enough that MRIs may not work on her. Of course, no reason X-rays would, either. I was just reading a decent superhero novel where the protagonist was retired because his knee got shattered in a fight and his limited invulnerability meant that there was no way to perform reconstructive surgery. So he spends the entire book hobbling painfully around on a crippled joint and a cane, occasionally swatting opponents insensible or destroying cars. Well, a CT scan involves a ton of radiation, about 100 times that of an X-Ray. I’m not usually one to worry, but it seems risky to do them regularly. That novel looks interesting. I just got the sample, and I’ll check it out. It sort of reminds me of a character from the “Heroes Rise” game series. In the second game, you meet a character with strength powers who has fancy prosthetic legs because his upper body mass ended up being too much for his legs, and he had them amputated. I don’t remember the details, but I think he had serious knee issues and was in chronic pain. Which is weird, because ‘invulnerability’ should foil radiation more than it would comparatively harmless magnetic fields. I guess both machines look pretty much the same, especially when drawn in a superhero comic though. It was meantioned a while back at the doc is monitoring Alison long-term to try and understand her powers better, this is probably just a standard test. Oh yeah, thanks. That makes sense. I was confused because it’s not like Alison is hurt. “The killer is actually telekinetic?” Wow, de’ Nile ain’t just a river in Egypt. Have you guys ever heard of Occam’s razor? More often the simpler solution is the correct one. So which is simpler: an invisible assailant who carries their weapon in and out, or a long-range TK with remote sensing, either psychically or technologically, using a weapon. Why would a TK use a weapon instead of just sending a piercing TK spike into the guy’s heart or other critical structures? Occam’s razor, of course! Dot ting ken cut through *anyting*! Why would a telekinetic necessarily be capable of manifesting straight-up Green Lantern-style projectiles? It’s not like there’s a standard fictional rulebook for made-up psychic abilities that any of these theories are violating, and for all we know as readers, there are no telekinetic “biodynamics” in the SFP universe. Occam’s razor goes right out the window once capes are involved. Too many unknowns to ever make a reasonable judgment about how likely something is. Kids, never throw a razor out a window. You could hurt someone. I love the made-up jargon. It’s sounds exactly like a role-playing game when the players read the rule book and then try to make stuff up to justify game effects in-universe. Pretty much all the dialog in the last 3 panels. It’s not made up words, per se, but made-up uses of existing words. hunh, difference of perspective I guess. If you handed me the dialogue as text on a page, I could think of several dozen things it could be part of off the top of my head. Actually, looking again, it’s just Alison’s dialog. The doctor isn’t using any superhero jargon. She should *at least* mention that she dusted the room and discovered an outline that then fled. Sheesh. Agreed, and an investigation of the scene would have found dust, and the lack of it behind the person she saw, footprints IN the dust from the escape. Plus, no way forensics would confuse a knife blade for a sliver of something being shoved telekinetically, too much other trauma to the surrounding flesh, ect. by this time they should be able to tell the model and brand name of the damn knife. That seems super weird. Like, even if she did not mention it, they must have seen the dust and concluded that she dusted the room. Unless it was painfully obvious that the killer was invisible (which it probably was), they would have asked Allison what she saw. So there’s no reason either the people doing the investigation or Allison can not know what the others know. Exactly! She should also mention the possible asbestos exposure. If Cleaver is more or less what happens when a biodynamic person gets cancer, Alison should probably discuss that with her doctor. I wonder if that might actually be her anomaly in the first place. Being so forgettable that, if she ratchets it up, even if you’re looking you fail to notice her or do see her but instantly forget her (like a reversal of the Silence from Doctor Who). You have to confuse your brain (think plaster dust) to remember her if she’s trying hard to not be remembered. But, even if she turns it down, it’s always kind of on at a low level, thus fueling her issues with inadequacy. Essentially what I’m saying is that maybe she’s some sort of telepath who can edit people’s memories of her unconsciously. I know not the reference you make. Is this a book/comic/movie I should check out? The last two sentences you said are pretty much an accurate description of Imp. Is there another known character with such an ability in some other book/comic/movie or did you just happen to think of such a manifestation of superpower? Given what happened to Clive, how the heck do they think that the long-range TK theory is remotely plausible? Moonshadow injured Cilve to create a distraction. That still a valid escape strategy for, say, a TK who has only moderate range and was actually somewhere in the building making their escape. While that sequence could still be a telekinetic (‘someone’ might not be true), attacking Clevin seems out of character unless the problem is that he’s in the way. Beyond that, looking at the crime scene and interviewing Clevin, unless he’s forgotten everything due to shock (which seems unlikely) should let them put plaster dust as after discovering scene, before attack on Clevin, and it actually seems to have produced a decent outline, which should be another indication of someone being present, and also they should be able to fill in the “They just-” with ‘knocked over Alison’ or something. That sort of argues that something (possibly Moonshadow’s anomaly, possibly someone in the PD deliberately obfuscating things) is making a mess of the investigation. I think Alison wants to at least make initial contact with Moonshadow before she sets the authorities loose on her tail. People have been speculating that her anomaly is psychic instead of physical, but then someone pointed out that if that were the case, she wouldn’t be invisible on surveillance footage. So I’m not sure what to think. Yeah but the people viewing the camera would forget her just like someone in the room would forget her. If anything this theory is bolstered by the fact that we know that TK can function through the camera. Super powers in this comic don’t just affect local events, at sufficient power they can affect a wider area, and there is no doubt that Moonshadow’s powers are sufficiently powerful to attain this effect. Though I guess one could argue: if her powers are so persuasive, why could Allison still see her eyes? Either super brain offering some immunity, or Moonshadow herself, seeing Allison (who probably illicits strong emotional reactions from her) made her waver for a second. Megs also has more experience than most when it comes to interacting with one flavor of psychic or another. They’re not talking about TK powers that operate through cameras. They’re talking about people using long-range telekinesis while viewing a camera to see what they’re doing. 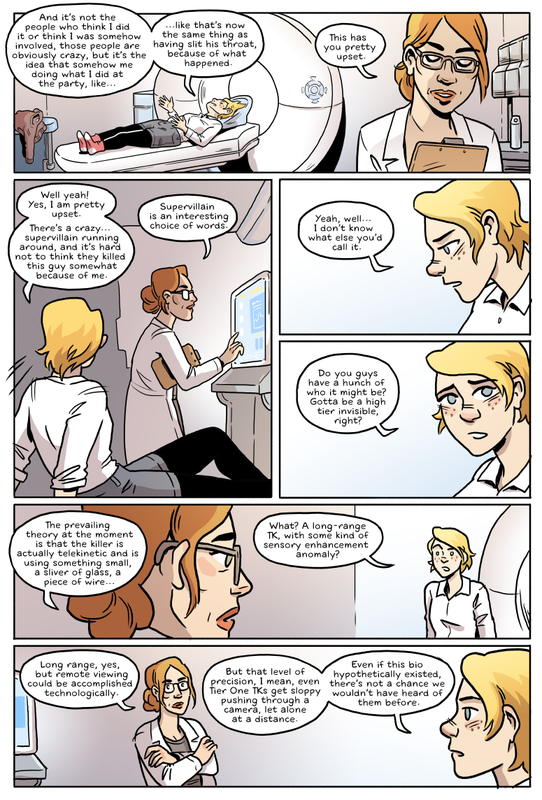 (In particular, see Alison’s line in panel 4 and the doctor’s line in panel 5.) For psychic invisibility to affect anyone who watches a video anywhere in the world at any time, it would have to be encoded into the video file itself, but video formats don’t set aside extra bits for psychic metadata. I think that was me? Though I hadn’t considered till just now that it might be both. Not saying it is, but… yeash, that’d be one nasty whammy. On full burn you don’t even remember there is an invisible person you have to defend against! That would depend on the range and nature of the ability. Forget me mode could just as easily wipe your memories of seeing her in a recording as in person. There’s a bit of precedent for “psychic” powers working like that if TK works through a video camera. I assumed Allison was covering up for her teammate until she had a chance to confront her personally, but you make an good point based on what we know about Moonshadow’s powers. Is he jumping? And if so, is he a gas? Jack Slash is a character in a web serial novel called Worm. The series follows a young girl named Taylor Hebert who lives in a world of superheroes and finds herself triggering and developing the ability of Arthrokinesis which she uses to great effect during the story. Jack is the leader of a group called the Slaughterhouse 9, a group of super-villains who are considered a threat that pretty much requires all hands on deck in an attempt to stop them. His power is the ability to extend any cutting edge he holds invisibly as long as it is in the same plane as the knife.. It is still the top novel on top web serials despite having been complete for over a year. That looks to have been around 6′ away, around a corner, from someone with her back to the microphone, and may not have been speaking very loud; picking that up would be a challenge. However, picking up “You’re going to be okay. This cut’s not supposed to kill you… it supposed to buy some time” seems trivial, unless the phone somehow hung up. I wonder if the reason Alison is asking about the police theories is because the police investigation seems off. I mean, I’m pretty sure lying isn’t one of her anomalies either, did the police even interview her? OK, upon re-reading, another thing stands out: WHY do “those guys” think it’s a telekinetic instead of an invisible? Ignoring the crime scene Allison was just in (which should have only made that seem less likely,) we know that these people know of invisibility powers, and know at least something about both those and telekinetic powers. All of the evidence seems to suggest invisibility OVER telekinesis… I mean, a sliver of glass? Really? But even if both scenarios seemed equally plausible, why jump to the one over the other? Why not at least say “the prevailing theory at the moment is that the killer is either invisible or telekinetic?” Even if telekinesis seemed more likely, why would they rule out the (glaringly obvious) possibility that the killer is invisible? 2) The settling on the killer being telekinetic, and discounting invisibility, isn’t a reasoned conclusion, it’s a choice. It’s *deliberate*. And since the killer IS invisible, it suggests that not only do they know, but that they are deliberately setting the investigations in the wrong direction–and the only reason for THAT? They, or someone pretty high up, wants Moonshadow protected. In fact, she’s probably been SANCTIONED to do this by someone(s). At the very least, one or more inside elements are aiding her cause. Side note on top of it all: Allison’s caution in revealing what she knows makes a lot more sense now. This is going to get reeeeeally nasty before it’s all done. I think Alison is not sure of what she saw. Besides, this is just a few seconds of conversation. Maybe she’ll get to it. And Moonshadow’s anomaly doesn’t seem psychic. In the last panel of Moonshadow escaping you can see distortion on the exit door’s frame. That implies an actual visual distortion of light. I think your idea of moonshadow being protected is a very plausible option. Even if it’s not consciously a choice to protect her, if she’s the only advanced invisible super that the government/public know of, and she’s been fighting crime for half a decade, they probably just automatically count her out. Think about it: if a man in the DC comics showed up cut in half by a thermal beam, the last person you’d think of would be Superman (at least, a sane, rational, non-alien controlled Superman) (for the record, I am more of a casual comics fan, not a die-hard, so I’m probably missing some obscure story line). I don’t think “mistrust” is the issue, I think it’s “this makes the bureaucracy look bad”, for “bureaucracy” read whichever organization or organizations are supposed to be overseeing the government’s pet biodynamics. They *don’t* want “ex-government-agent is now a serial-killing SJW on a rampage” to get into the news-cycle. I don’t have a good feel for how different this world’s politics are, given that it’s a place where the city of Boston can get taken over by mind-control supervillains. That’s a level of cultural insecurity that the real-world USA doesn’t have to deal with, at least not on its own soil. Illustrative anecdote I have from a friend of mine who was military intelligence in Iraq back in ’08. He said that one of the things that created enormous chaos in trying to tamp down the insurgency was that a great deal of the day-to-day violence wasn’t even related to the war per se. His predecessors in his sector had told him that they eventually figured out that a good number of their civilian deaths and destruction had been caused by straight-up serial killers just going wild – not political in the least, just doing what murderous lunatics do in the absence of public order. On the other hand, what if this is exactly what Allison is thinking? Seems a bit overly irresponsible of her if so though. There’s also the possibility that she’s working for or being manipulated by someone, and they’re obscuring the trail. a) I think Allison might be being baited here. They know she knows more than she’s saying, and they’ve found the evidence for an invisible person. By giving her the impression they’re on the wrong track, they see whether she’ll choose to correct them or not. This might be because on their list of high tier invisibles moonshadow is the top, and if Alllison lies for her then it’s an indication it’s her. b) Allison has connected a few dots here. Moonshadow is exacting her own brand of justice on people who regularly go unpunished, but the fact that they’re all abusers/rapists may be more than “she was looking for a target so she chose one”. Allison is probably wondering how personal exactly is her personal vendetta against rapists, so she definitely wants to talk to Moonshadow first. Jeez! I leave for one day, and the new strip already has 57 comments! (As of posting, that is! See Rod’s post above… I’m not saying it’s my first theory, but it’s a good one. Hmm… No Dramatis Persona… Oh well, no way to spoil us I guess. Anyway, Moonshadow’s power or anomaly is either invisibility or like The Shadow, she can cloud men’s minds, not telekinesis. I’m going for invisibility from the way she took down the mercs earlier and how Allison immediately threw powder into the room to see if someone was still there. It’s a stretch to believe that being able to confuse someone into not seeing you and being seen by throwing dirt or powder on you. That screams some sort of invisibility ability or being able to bend light around your body. To be invisible, The Invisible Man had to be naked. In Mystery Men, the Invisible Boy not only had to be naked, he had to be unobserved also (Hey, it’s weird, but it was written by Bob Burden who made a carrot into a superhero). Mary becomes partially visible for a moment, as if she needed to uncover her eyes to see who was there, which would go with the physics of bending light around your body and clothes. It doesn’t explain how she was able to take out the mercs and kill those people, so I don’t think she’s affected by it. No, she’s invisible. She unshaded her eyes just so she could taunt Allison, to dare her to try and stop her. I think she’s not telling the doc because she’s going to talk to the one person who can find Mary; Menace. Oooooh. I had not thought of that last part, but it makes a lot of sense. As someone who runs a game of Dungeons & Dragons, when I read the comments section I have to ask; how much of the input on the final story, approximately, comes from reader influence? Heya! Molly (the artist) here: I read the comments lightly to make sure no one’s slinging hate speech, and Brennan (the writer) doesn’t read them until we’re well past a scene, for exactly that reason. We also have a few days at least written/drawn in advance so it’s not changing in real time. Some of you guys are just startlingly good at guessing and predicting! Hyes but ken it cut through dat Jägers fancy hat? Wasn’t one of the first things we learned about Mary that it’s hard to focus on/remember her? I wouldn’t discount the conspiracy theory (heh, first time I ever said that) as it fits what we know of the world very well, but it could be an effect of her powers. The first and most natural thought is: invisible killer -> prominent invisible person -> Moonshadow -> power shenanigans -> stretch to fill resulting blank in thought process -> unnecessarily elaborate and poorly fitting theory of TK killer. Note, the mercenaries died in an a small, enclosed space without windows. A teke on par with the one Megs and Feral could have done it, but it doesn’t fit the MO being described here. I think the hard to focus/remember aspect is more of a common assumption in the comments over anything implied in the comic. I also find it interesting everyone seems to assume Mary could always turn invisible and it not being a new manifestation of her increasing power. Allison is in the process of blaming herself for everything that’s wrong with the world because she hasn’t fixed it yet. I think we left reasonable behind a long time ago.